ONCE again there is talk of a funding crisis facing higher education and some are talking of cuts as swingeing as those enacted during the first Thatcher administration…During the last two decades, university managers, academics and others have become accustomed to increases in the level of income in support of teaching and research, and although the sources of income have been diversified, there remains a great demand upon the public purse to deliver increasing resources to universities. There are questions of justice regarding this – particularly in Scotland, given that students make no direct financial contribution – for many who pay for the provision of university education do not participate in it, and much of what is paid for may not be valued by the wider society, nor deserve to be. Haldane refers to two mid-19th Century works: Newman’s Idea of a University and John Stuart Mill’s Rectorial Address to the students at St Andrews University, delivered and published in 1867 (it lasted for three hours apparently). From the perspective of the present, the most striking features of these two accounts of the nature and value of university education is what they exclude. Newman thought that it was not the business of universities to engage in research. He writes that “a university is a place of teaching universal knowledge. This implies that its object is the diffusion and extension of knowledge rather than the advancement of it. If its object were scientific and philosophical discovery, I do not see why a university should have students.” Newman was not against research, but thought it should be conducted in special institutes. 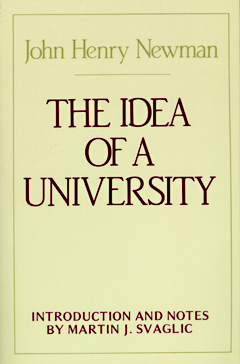 Mill likewise thought that the fact that certain activities are important for individuals and society does not mean they should be part of the university curriculum. the growing mass of researchers may have become a drag on and even an obstacle to the pursuit of the primary purpose of universities – namely, education. It impedes the effort to put students first and it consumes vast sums of private and public funding. So, given the new constraints on funding higher education faces and will continue to experience, the proposition is that we consider rebalancing limited funds to invest more heavily in teaching and learning and less in research. Controversial stuff but, as he shows, entirely in keeping with the ideas of Newman and Mill. Lord Mandelson delivered the keynote address at the Lord Dearing Memorial Conference held at the University of Nottingham in February 2010. Lord Dearing was very clear that our higher education system was central to what made our society intellectually curious and critical, what made it socially just and humane. It is the place where we define and redefine our sense of ourselves and the forces that shape us. Universities have been able to leverage a steep rise in non-state funding. They have widened their sources of income by exporting their teaching brands, opening their doors to fee-paying international students. Higher education is now a major export industry for the UK and a key comparative advantage – some £5.3billion in exports in 2008. Nottingham has done this very well. The best university systems in the world are defined by a wide range of public and private funding and British universities need the same diversity. I recognise that sources of additional business income are not limitless and can be irregular, especially during a downturn. But even a small expansion in this work would go a long way in closing the gap created by a period of fiscal constraint. The push to save costs can and should actually push the system in the direction of the modes of study I have been advocating. Part-time degrees, shorter and more intensive courses all offer the potential to lower student support costs, use resources more intensively and improve productivity. Not terribly convincing. Whilst strong arguments about the need for savings can be made, the proposals around alternative modes of study are much less persuasive.